For many dogs, New Year's Eve or Bonfire Night are no fun. Sudden flashes in all kinds of colours, crackling noise, hissing, whistling and lots of loud bangs can be very scary. It is understandable that many dogs don't know what to do with themselves! It is not known exactly how many dogs suffer from a fear of fireworks, but a large percentage of dog owners are aware, to a greater or lesser extent, that their dogs are nervous or anxious. This can be expressed through restlessness, squeaking, barking, fouling and destructive behaviour. By the end of the year, veterinarians are often asked to prescribe calming products to make dogs a little more comfortable during the fireworks season. However, it is much more effective and sustainable to start with firework training. Even if you start just a few months ahead of time, there is a good chance that Bonfire Night or the New Year will go a lot smoother. Of course, after reading this article everyone will start training right away! Here are some last-minute tips for you. What do you do if the New Year or Bonfire Night is coming up and your dog has a fear of fireworks? Take the dog for a walk in a quiet area well before the start of the fireworks, and make sure you do not take the dog outside when fireworks are being set off! Use calming supplements or products, such as Zylkene, Adaptil, and/or a ThunderShirt. Anti-anxiety medication is available from your veterinarian. Products containing acepromazine used to be prescribed. However, research has shown that dogs treated with acepromazine appear very calm, but are anything but. In fact, the stimulus is enhanced, while dogs are unable to react to it. The result is a worsening of their fear. Make sure that your dog is in a room with curtains to stop the flashing lights and where sounds from outside can be reduced. Create "counter-sounds", such as music. This will block some of the sound of the fireworks. Provide distraction. A Kong, filled with all kinds of tasty stuff, can be a great way to distract your dog. Make sure it is filled with treats that your dog only gets very rarely and that he loves. If your dog flees or has found a hiding place, leave him be. Do not take the dog away from its safe zone. Reassure your dog, without mollycoddling him. Allow your dog to sit with you, stay calm and show him that you are not afraid. If you cannot provide a calm environment for your dog at home, consider going to stay somewhere else with your dog for a little while. How does your dog develop a fear of fireworks? From the age of 3 weeks, your puppy starts the socialisation phase. During this phase, puppies are very curious by nature and will not be easily frightened. If they are unexpectedly startled by something during this period, they usually shrug it off without any issues. From the age of 12 weeks, the so-called "fear phase" starts. 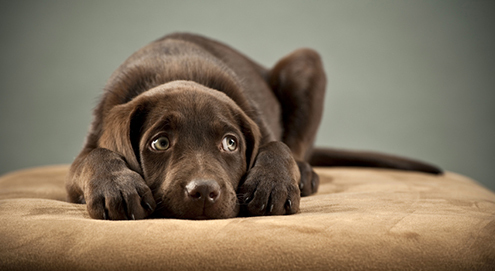 In this period, young dogs can easily be startled by something and develop a fear of it. They do not recover as quickly from a negative experience and this may be the basis for a fear (of fireworks). Why should a fear of fireworks be dealt with? You could think, it doesn't last long, and it's only once or twice a year. However, aside from the fact that it is a horrible experience, your dog will become more fearful after every negative experience. This may cause the dog to develop a generalised fear. This means that your dog may also develop a fear of other loud noises, such as thunder. Instead of a problem that occurs once a year at a set time, your dog will be anxious frequently and at unpredictable times. This has a big impact on a dog's well-being. As the behavioural issue continues, it becomes increasingly difficult to deal with it successfully. However, dogs continue to learn throughout their lives. So ideally, dogs with behavioural problems should start with behaviour training as soon as possible, but it is never too late to start. How can a fear of fireworks be dealt with? Train your dog! Dogs are good at learning by association. This means that they will quickly link events. This can be done using the principles of classic conditioning, such as the well-known Pavlov experiment. Another method of learning is operant conditioning, where a dog makes links between its own behaviour and the consequence. This includes jumping up at people and getting lots of attention, for example. When training a dog with a fear of fireworks, we want the dog to start associating the fireworks noises with something fun. We call this counter-conditioning. Special CD's with firework sounds are available for this approach. It is important that you play with/train your dog for a few minutes every day, whilst playing the noises very quietly in the background. The toy or reward must remain exclusive, meaning you should only use it during training or when you play together. This keeps the dog interested. Dog have a better ear for low register frequencies than humans, and in very anxious dogs you should start playing the sounds at a very low volume. If your dog shows any signs of fear, turn the volume down even further. You should never punish a frightened dog. The only result that will get you is that the dog will associate fireworks or thunder with punishment. How can you prevent a fear of fireworks? People get young puppies used to all kinds of things: children, old people, traffic, other dogs, other animals and so on. However, they often forget to get young dogs used to various sounds as well. On New Year's Eve or Bonfire Night, we know what to expect, but dogs have no idea what is going on! Trying to escape from loud bangs is a natural reaction. The best thing to do is to get puppies used to the sound of fireworks from a very early age. Of course this should be done calmly. The method of training is comparable to dealing with a fear of fireworks, but the advantage is that a young puppy without negative experiences will learn this much more quickly. The puppy will associate the sound of fireworks with positive attention from its owner. "Frightened dogs should be ignored." Myth! People used to recommend completely ignoring dogs when they were afraid. However, the idea that reassuring the dog when it is afraid will enhance its fear is a myth. According to experts on canine behavioural therapy, behaviour can be enhanced by giving your dog attention, but this does not apply to emotions such as fear. Being ignored when you are afraid is not nice! It is important that you reassure your dog without mollycoddling him, constantly stroking him or hugging him. "The dog will get used to it if we walk him when fireworks are being set off." Myth! If a person is afraid of heights, taking him to the top of a tall building will not "get him used to it". The same is true for dogs. Instead of immediately exposing dogs to fireworks, they must learn that fireworks are nothing to be afraid of. What is more effective is to teach them that fun things (positive attention) always happen when there are loud bangs and/or flashes. "If you are walking your dog and unexpectedly come across fireworks, the best thing to do is pick up your (small) dog if your dog is frightened." Fact! Picking the animal up (if possible) and going home is the best option. Try to avoid further negative experiences. For animals suffering from stress. Spot on & collar varieties to reduce anxiety & stress. Has a soothing effect on cats.